More than 50 000 works representing painting, graphics and sculpture can be seen at the National Arty Gallery. 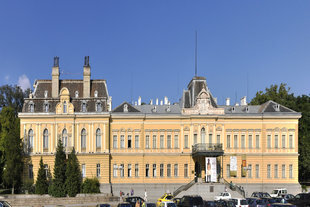 The gallery is housed inside the former royal palace in the city center of the capital Sofia. In the luscious halls of the gallery are regularly organized exhibitions of contemporary art and presented the diversity of Bulgarian art since the Liberation. In the crypt of Saint Alexander Nevsky Cathedral can be seen works of Bulgarian Orthodox art. The collection covers a large period of time and includes a lot of beautiful icons. Read more about the National Art Gallery at the Official Tourism Portal of Bulgaria here.